My name is Trish and I am Kundalini Yoga and Meditation Teacher, a Reiki Master Teacher, a Shamanic Healing Practitioner and a Sound Healing Therapist. I have been practising the healing arts for over a decade and teaching kundalini yoga and meditation and hosting retreats since 2013. I believe we all have the power to connect to our own true bliss and I work with an open heart to facilitate helping people to embrace life and move further along their own path to happiness, harmony, joy and love. I absolutely love Kundalini Yoga and I truly believe that this powerful yogic technology is one of the greatest blessings we have, as human beings, at this time. Kundalini Yoga transforms and really helps us to connect to ourselves and the world we live in. And it works fast! We can move through blocks quickly and we can begin to step into our true destiny. I also work with the sacred vibration of the gong to bring about release, healing and moving energetic blocks and incorporate the gong into a lot of my healing modalities. I work to bring people into their power and radiance and this path is such a pleasure for me to share. I absolutely love to share the retreat experience and feel very blessed and honoured to guide people back to meeting themselves. Xuclar Beach House in Ibiza is my home and it's an incredible place in the forest on a mountain opposite the sea. The vibes are high, life is strong and something very special happens here! If what I do resonates (further information on healing below) and you would like discuss further, have any questions or would like to join us for a retreat experience please do get in touch. The Japanese word Reiki means “universal radiant energy” and Reiki is an ancient form of natural healing directed at achieving balance and harmony of mind, body and spirit. I channel the energy through my hands and the Reiki energy balances the chakras (energy centres) of the body. Because the Reiki energy works on all levels the causes as well as the resulting illness are being treated in all cases. This is a non-invasive therapy that can be used without any fear of negative side-affects. On a physical level Reiki helps to alleviate pain. Reiki heals emotional issues and de-stresses and relaxes the mind. This healing works in a gentle but profound and magical way, which taps into the body’s own natural ability to heal itself. 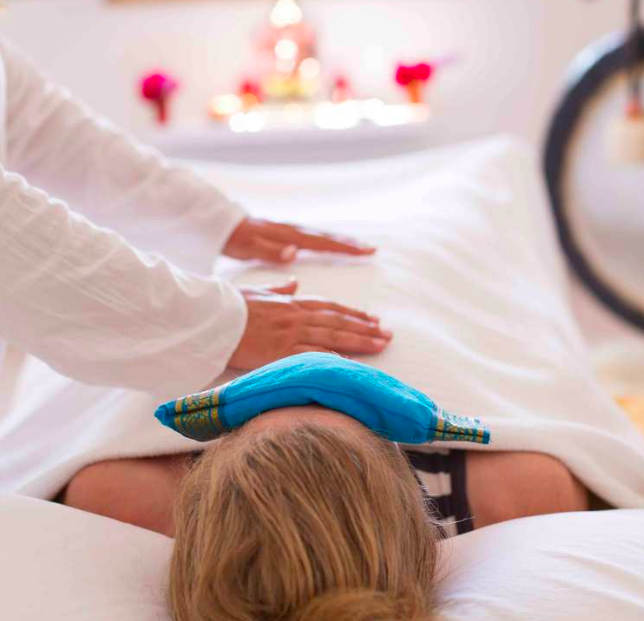 Reiki balances and harmonises and after the treatment the recipient will feel relaxed and will have a feeling of having experienced something truly beautiful. I also train Reiki practitioners to Reiki Master Teacher level. I train on a one-to-one basis or with groups of 2 maximum so we can tailor the training to the gifts / strengths of the student and allowing us to bring about deep and powerful healings. This transformational healing technique heals the light body, restores the soul and brings the client back into harmony and balance. Through this healing we feel more present in our bodies and our lives. Shamanism is the most ancient spiritual practice known to humankind. We know from the archaeological evidence the practice dates back at least 40,000 years, whilst some anthropologists believe that the practice is over 100,000 years old. The Shamanic theory is that all things are connected and everything that exists has a living spirit and that illness and disharmony is due to the loss of soul. It is this soul loss that we focus on in this healing. It is believed that whenever we suffer an emotional or physical trauma a piece of our soul flees the body in order to survive the experience. It is our inbuilt survival mechanism. There are many common symptoms of soul loss. Some of the more common ones would be dissociation where a person does not feel fully in his or her body, alive and fully engaged in life. Other symptoms include chronic depression, suicidal tendencies, post traumatic stress syndrome, immune deficiency problems, and grief that just does not heal. Addictions are also a sign of soul loss as we seek external sources to fill up the empty spaces inside of us whether through substances, food, relationships, work, or buying material objects. I work with the belief that disharmony creates dis-ease and harmony creates beauty and health and through this healing technique I help clients to come fully in their own wholeness and light, which helps them connect more deeply with themselves and everyone else in their lives. Shamanic counselling is a spiritual counselling method, which aims to put the client into direct contact with their own spiritual power through teaching the basic techniques of the shamanic journey. The client goes directly to the spirits for help. The spirits are our true counsellors. Shamanic counselling enables us to find the source of –and solution to –the challenges and difficulties which we all face from time to time. This brings us personal empowerment, wisdom and healing. The shamanic journey also enhances our relationship with our spirits and can help us along our path in this life. This healing method works by first teaching the client to undertake the shamanic journey so that they can meet their own spirit teachers and helpers. By journeying, the client can seek help, healing or advice directly from the spirits. This can include personal healing, help with life changes, decision making and problem solving, work on bereavement, relationships, depression, emotional issues, spiritual development and much more. I am terribly excited about the power of this therapy as the healing is so powerful and after 6 sessions the client reaches independence and people can use these techniques themselves whenever they need spirit guidance in their lives. I also love the combination of the ancient practice of shamanic healing and incorporating technology so the treatment involves using an ipod for the shamanic journey and digital recorder which enables me to give the client a CD recording of their journey after each session. Soul Adventures Volume 1, the album, is a reiki infused journey into wellness. Created to support vibrant health, reduce stress and to enhance all healing therapies, yoga and meditation. All the natural sounds were recorded in India at sunrise in an attempt to capture the healing energy of the land there and infused with the vibration of the reiki energy. There are 7 tracks, one for each of the chakras down the body. Born from a desire to have the vibration of bass in the music I was using to support my healing practices this was a personal soul adventure I will always treasure. Soul Adventures Volume 1 was released on the Rasa Music Label and is available from iTunes and Amazon.